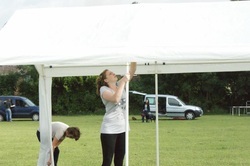 Who needs a ladder we have Emma! We were ready for kick off at 10.30pm.......yay!!! before she took the stage in the middle of the ring to meet the contestants. Katrina did a wonderful job and judged fairly and unbiasedly. The Steward did her best lol.....Sorry Clare didn't see you there ! Best in Show was Logan pictured here with mum Anna and judge Katrina. A very hansome dog and worthy winner. It was a beautiful sunny day and all went surprisingly smoothly, and to top it all we managed to raise over £550 pounds for the Algernon Trust.....Well done everyone !! 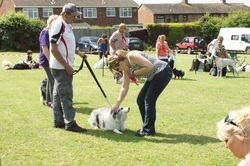 Yesterday evening 3rd June, nine dogs in my class went in for their Silver Kennel Club Good Citizens Award. The average age of these dogs is two years old. With Lola and Ferdi having only just turned one. 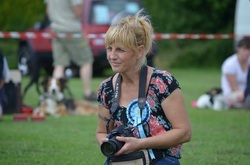 Julie the assessor arrived at 7pm sharp, and started them off on the road walk test. At this point Amber's mum came in a bit frantic that Amber's id disc detailed insufficient information. This was, thank goodness, rectified in time. You really dont want to be failiing your test on a technicality! I waited anxiously in the community centre, and very soon all the guys and their dogs came in, all quite positive that everything had gone ok with both the road walk and the vehicle control. Now in the hall for the rest of the test! All was going so well :) Then the "Come Away From Distractions" hahaha. Then Bob, oh yes Bob. Bob who won the most comedic dog award at the AGM. Poor Nick works so hard to prevent Bob getting bored and misbehaving. However Bob decided it would be much more fun to initially go and have a bit of fun and games with his mate Digby (the lovely red and white setter), and then he had to check out that tea cup on the floor. Who??? left that tea cup on the floor ?? 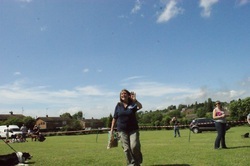 ?, was it our intake class instructor Clare.....surely not lol. Anyway all ended well, when Nick jumped about like a man possessed, called, made himself much more interesting then that empty tea cup Bob returned to his dad. Phew! 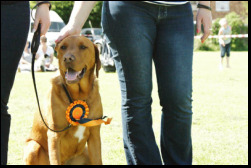 It think all the above proves that even in an assessment, dog training must be fun for both handler and dog, and without the cockups and mistakes dog training would be boring. This group of people are responsible good dog owners and they want their dogs to behave, but they also accept the odd misdemeanor and continue to laugh and enjoy their dogs, which I believe is the way to get the best results. Hi, being a dog training instructor can be, frustrating, rewarding and hilarious! Watch my blog as the tales unfold!